Website Update: Loads of Stuff! 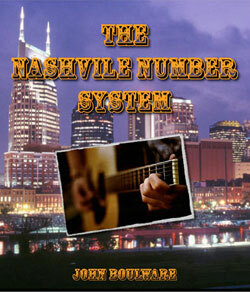 Nashville Number System eBook Released! First off, you'll notice that this newsletter looks just a bit different. There is a picture below, more links, and the header is different. Also the table of contents above is clickable. Click on different sections there to jump to them. to check out how these work and write something new for us! This one is pretty self-explanatory, but still very cool. There is now a whole section for free music theory worksheets. Print these out and use them to test your knowledge or challenge your students or friends. The answers are included on the last page of the worksheets so you can check your work and correct any mistakes. -Nashville Number System eBook! $6.95! Special Newsletter Price! I have recently written a book that I am very excited about, detailing how the Nashville Number System Works and how YOU can use it in your music everyday. I normally charge $8.95 for this book, but since you are a newsletter subscriber, you get a special discount at $6.95! You can click the picture above to learn all about it, but remember, YOU HAVE TO USE THE LINK BELOW TO GET THE DISCOUNT! One thing that some musicians don't pay enough attention to is song structure. This is the order or the skeleton of a song. Songs are made of parts, which are made up of a certain number of measures. Different songs have different parts. Words like intro, verse, chorus, bridge, break, solo, and tag come into play here. Here are some quick definitions. Intro - this is the start of a song. It could be as simple as a couple of notes, or it could be a great passage that lasts several minutes. Verse - these are the part of a song that tell the "story" if there is one. There are usually around 3 verses in most music, though some songs can have lots more. VERY rarely, you will find a song that doesn't have a verse at all, only a chorus. Bridge - A bridge is a section that sometimes goes between a verse and a chorus, or between a chorus and a verse, and is generally only played once in the song (though it may be repeated). While MOST songs have both a chorus and verses (because they both help to balance the song out) a lot of songs don't have a bridge. This is not seen as a "necessary" part of a song by most people, but it does add color and dynamics to a song. Break/Solo - These two names are interchangeable and mean the same thing. This is a part in a song that is played by just instruments, (no words). The melody of the break or solo can be modeled after any of the three previous parts mentioned. As with a bridge, a lot of songs do not have this section. While it does help to break up the song and add variation and complexity, it is also not seen by most people as a "necessary" part. Tag - this is the very ending of a song. Like the intro, it is usually just a few notes, or maybe a couple of measures, but can last longer. Note that some songs will have complex endings lasting a long time and involving a lot of changes, but the tag is just the very end. The final notes that are played. It usually doesn't last more than a few measures. Anything significantly longer than that is usually referred to as the general "ending". The tag is just the last idea in the song. Why is this important? As musicians, we can use these different parts to navigate a song. When playing in a band, it is necessary to know at least a few of these terms. "Hey man, why don't you play a guitar solo after the second verse." "I'm going to do a drum fill going from the chorus to the bridge; that's where you hit that B minor chord." "Keep playing that riff until you hit those low E's on the tag." Read this article on major triads, then complete the following exercise. Using major scales, build the following chords. The first one is done for you. -50-Minute Hours: Wearing yourself out at practice is never a good thing. Some people say they practice for 4 hours straight, and maybe they do, but it's certainly not good practice. After a certain amount of time, your brain gets tired and needs a rest (as well as your fingers!) If you do want to practice for hours on end, shoot for 50 minutes, then take a 10 minute break, even if you don't think you need it. By practicing with these 50 minute hours, you can practice more efficiently for longer and not be totally worn out. Keep in mind that you can apply the same idea to any amount of time: 25 minutes then a 5 minute break etc. Just do what feels right for you, but don't wear yourself out. -Sloooow Dooown: Most people play things way too fast either because it's more fun, or because they think they will learn a greater amount of things in a shorter amount of time. However this is usually not the case. Slow it down! If you play everything slower, your timing and technique improve. Most people just blow off this practice tip. Don't make that mistake! It may not be obvious at first, but I guarantee that after a week of practicing everything slower, you will notice a huge difference in your playing.